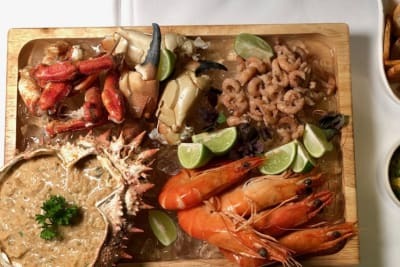 In recent years, the notoriously expensive rent prices of Hong Kong have forced a slew of restaurateurs to give up on their beloved Central locations, either closing permanently or setting up shop in traditionally less accessed areas. The inevitable result of this is simple: rising rents will eventually mean that the only restaurants that can afford Central addresses will primarily be chains and restaurant groups. If there are chinks of light, they are that Hong Kong still has a wealth of talented restaurateurs and chefs who are so confident in their own abilities that they are willing to fight the trend. 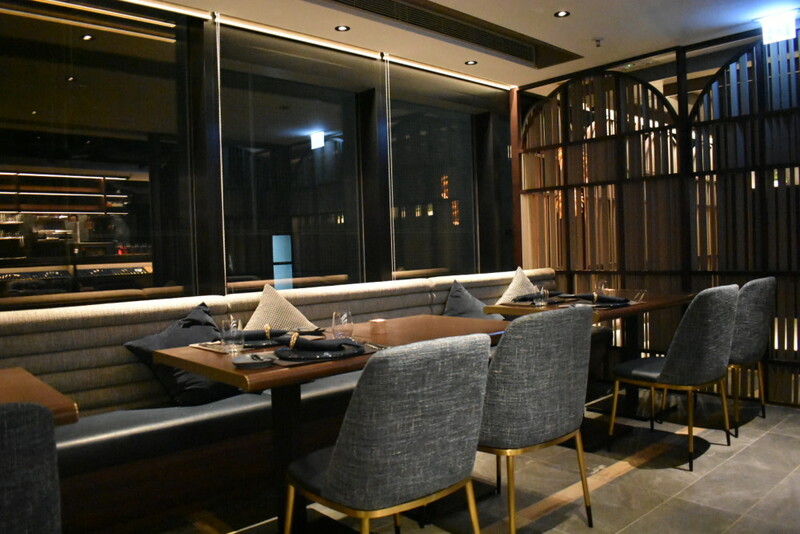 Two of them are CC and Vito, who, after closing their successful restaurant in Tsing Yi owing to an increasingly expensive lease, made the unconventional move of opening a new restaurant right in the heart of Hong Kong’s most expensive district. 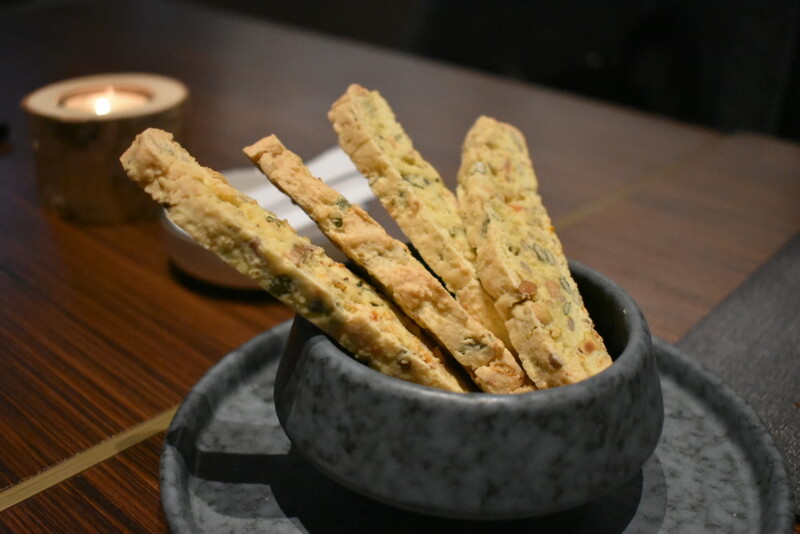 Their new creation is ROOT, a fine-dining restaurant situated at H Code, a hip new building perched at the top end of Pottinger Street overlooking Tai Kwun. 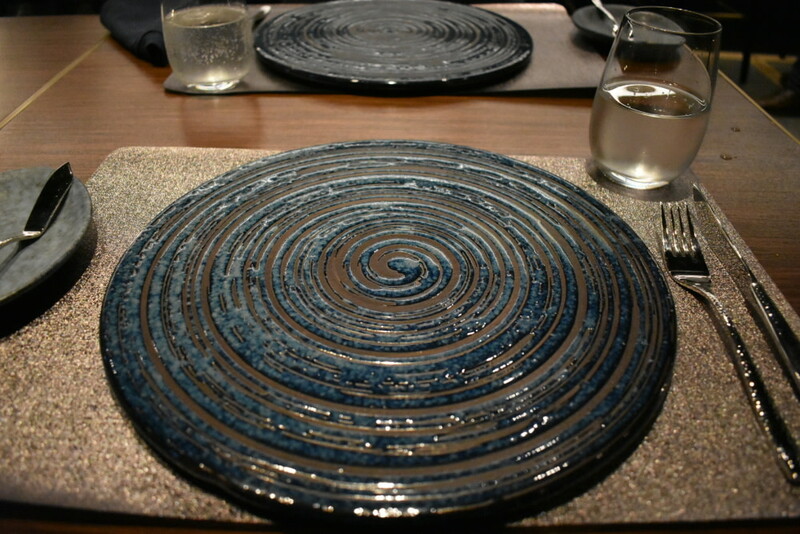 Right from the start, ROOT seems to have all the right ingredients for a successful fine-dining restaurant: a classy interior decorated with wooden furniture and different shades of muted blue, suit-clad servers well versed on each dish and a head chef (Vito himself) who has gathered experience at famed restaurants like Amber and L’Atelier de Joël Robuchon. It also ticks all the boxes in the current health- and sustainability-focused climate. 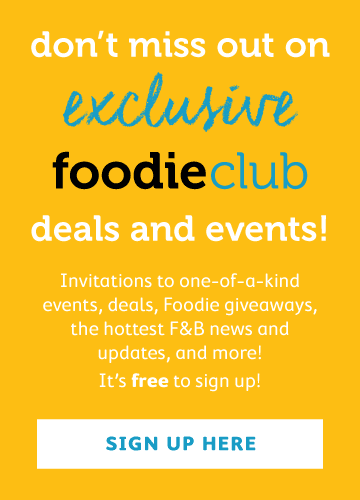 Not only does ROOT source all its vegetables from local, organic farms in Hong Kong, proudly boasting a farm-to-table ethos, but it also aims to limit food wastage to within 10 per cent. 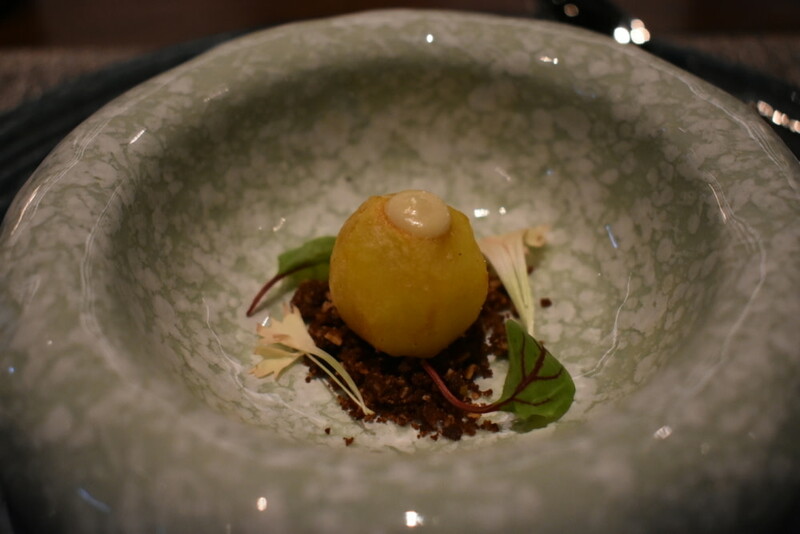 We dove into ROOT’s five-course degustation menu ($1,280/person), beginning with an amuse-bouche of sous-vide baby potato with mayonnaise on a bed of coco and almond crumble. 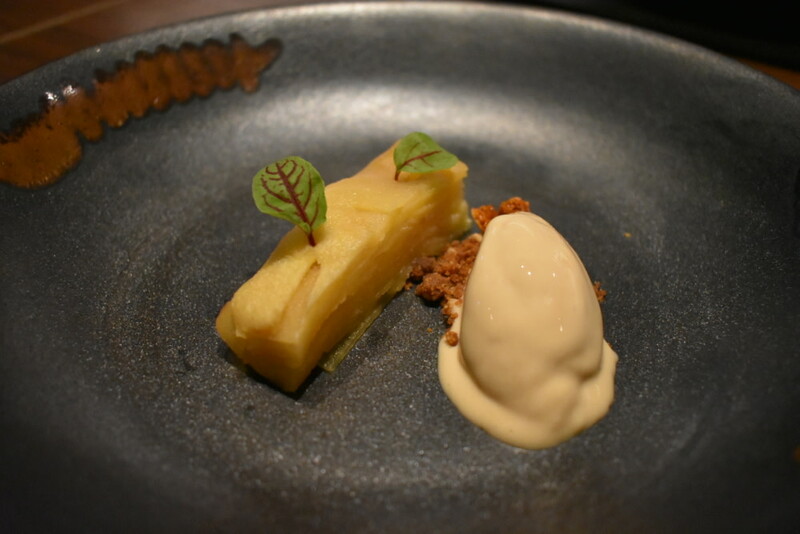 The potato was warm and soft, and the crumble created a delicate contrast of textures. 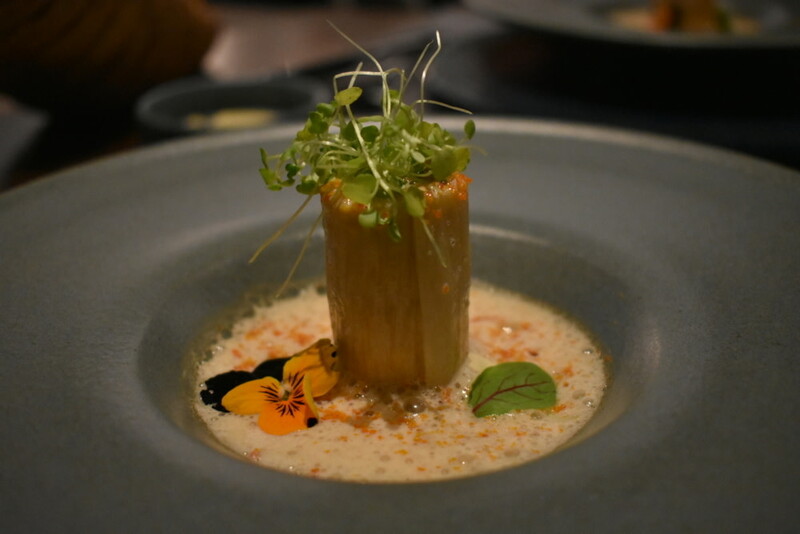 Next up was Coba, a confit bamboo shoot encapsulating crabmeat in a mixture of fish stock, Shaoxing wine and dehydrated crab roe. 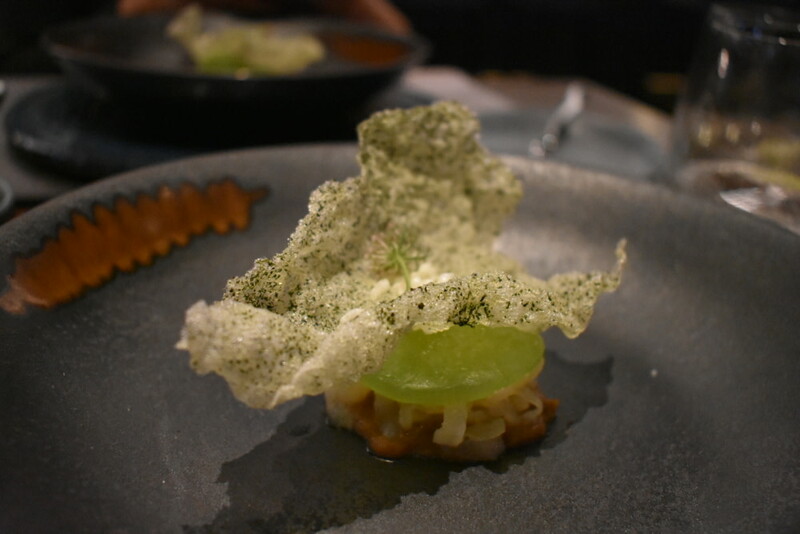 The crab was fresh and savoury, as was the creamy fish stock with its tart kick from the Shaoxing wine – overall an impressive dish that displayed deft skills and creativity. 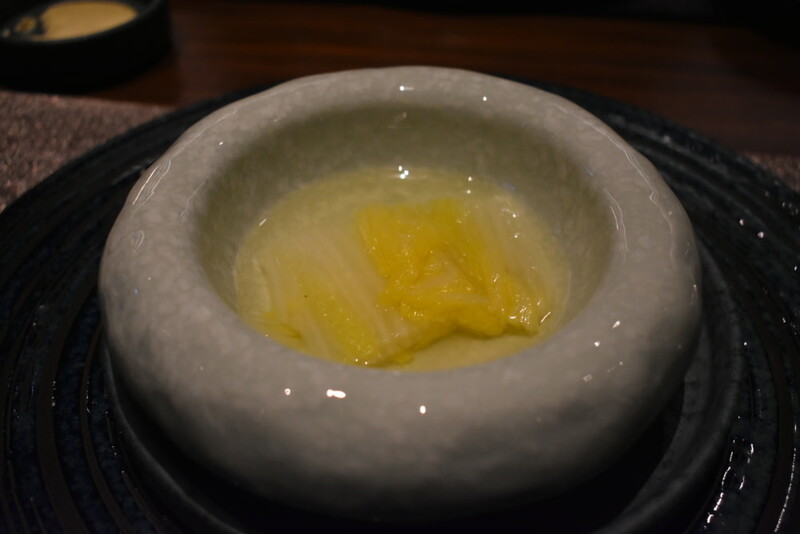 The jellyfish and cactus was certainly an unusual dish, served with a vinegar and miso sauce that was a delightful mix of sourness and subtle sweetness. For those who haven’t tried cactus, it’s curiously both gelatinous in texture like okra and crunchy like green beans, but we found the taste just a tad too bland even with the addition of ginger oil, though we do appreciate the efforts of the kitchen team in sourcing cactus seeds all the way from Mexico and growing them in their own garden in Hong Kong. The deep-fried rice paper was a beautiful garnish. 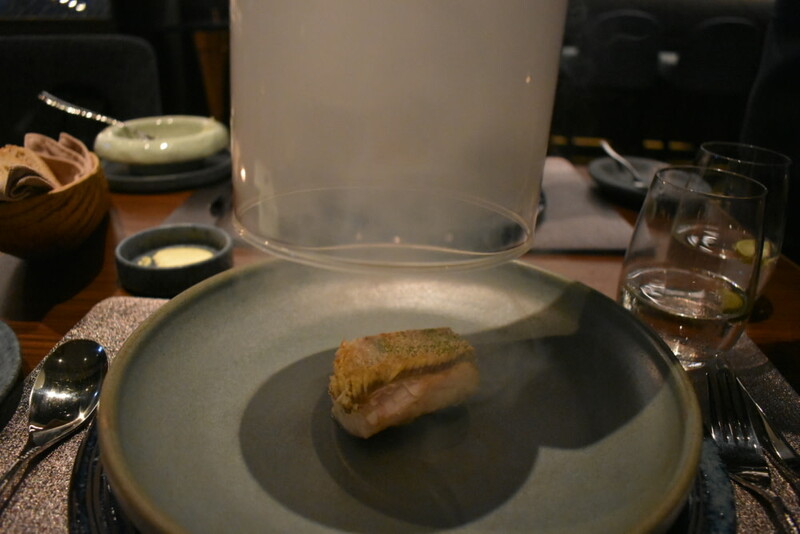 Moving on to the main dishes, the smoked and pan-seared amadai was beautifully presented in a burst of smoke. 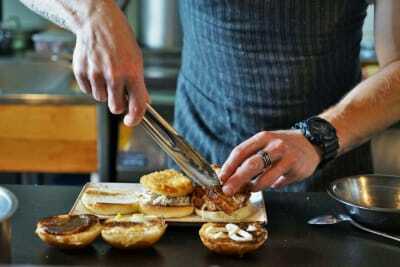 The skin was perfectly crunchy, while the flesh was firm and smooth, with a mellow, sweet flavour from the applewood. 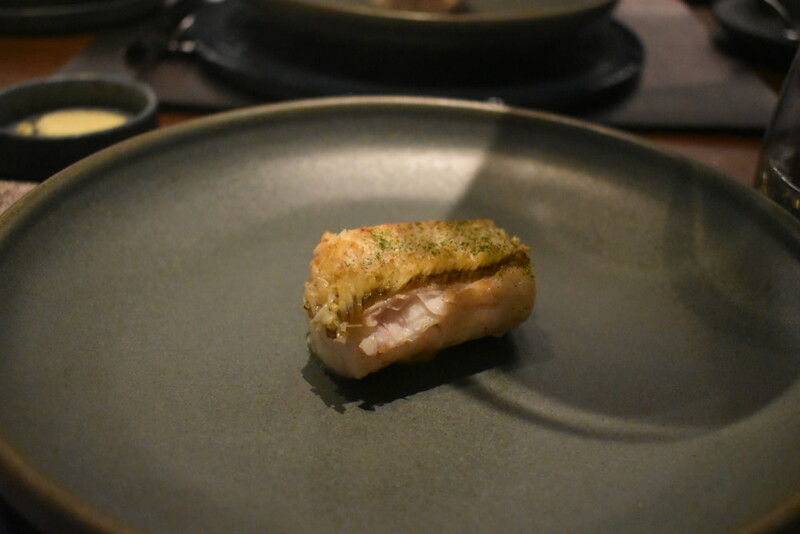 It was served with a plate of braised Chinese baby cabbage in broth that we found lacking in flavour. The highlight of the menu was the sous-vide and pan-seared suckling pig, served with fermented onion purée, cured apple and wine jus. The pork was first marinated for 12 hours before being slow-cooked for another 12 hours. 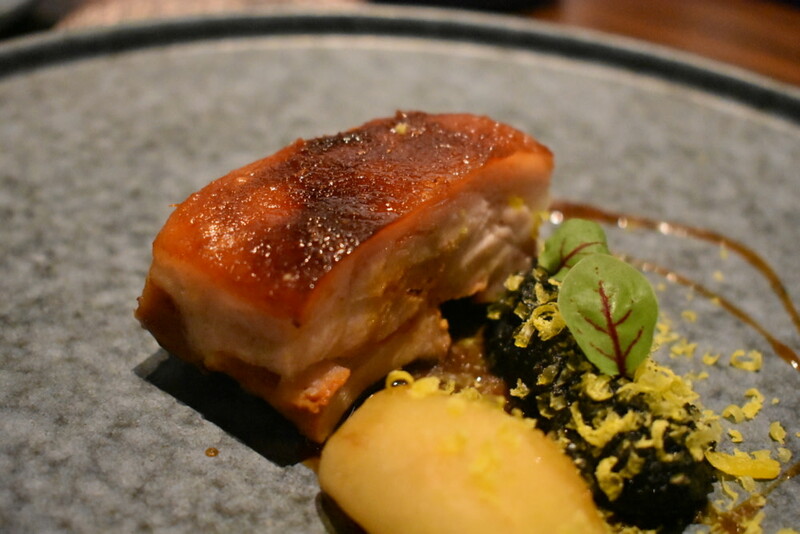 The result was an extremely flavourful and tender pork belly with a crunch of skin that added much-needed texture to each bite. The dessert was equally impressive. The apple tarte Tatin featured light, golden puff pastry with soft, juicy fruit. The small piece of honeycomb was a nice touch, and the cinnamon ice cream was another delicious treat. The petit fours were muesli bars chock-full of pine nuts, pumpkin seeds, sunflower seeds and more, though we found them a little hard and dry. The degustation menu comes at a hefty price without any wine pairings. While we can tell the team behind ROOT have certainly put in a lot of effort into crafting every aspect of the restaurant and dining experience, from each dish on the menu, to every garnish, to the beautiful cutlery used, we believe there are kinks in some of the dishes that need to be ironed out in order to justify its price tag. 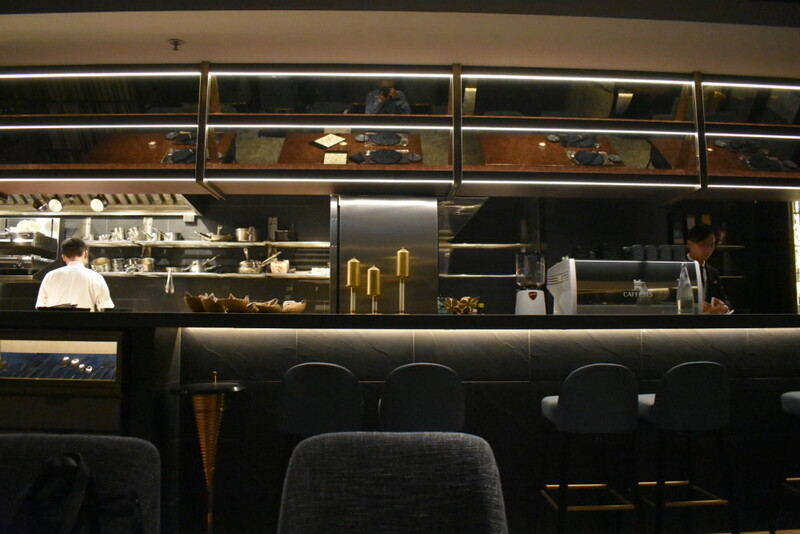 But based on the passion that practically oozed out of chef-owner Vito during our brief conversation, we have high hopes for this restaurant and genuinely hope it will scale new heights.